“THE BANKER’S SECRET TO PERMANENT FAMILY WEALTH™” by John Cummuta. The book is a quick read but it’s filled with powerful insights on how to create and preserve wealth. Enjoy the first chapter now! Download chapter 1 by entering your name and email. 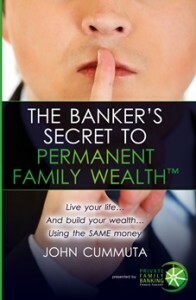 Purchase “The Banker’s Secret to Permanent Family Wealth” Today!